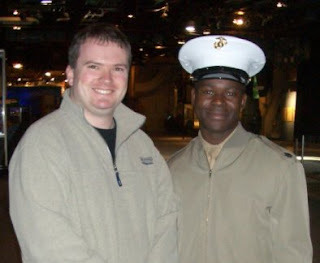 I visited the deck of the USS Intrepid berthed in New York on November 10th 2004, a part of a holiday with some friends. I met a Marine Staff Sergeant on board who was obviously just visiting himself, showing his gal around. My buddy approached him and requested that he pose with me for this photograph. I think he just wanted to see if the Sergeant would recognise me, I dunno. As we parted company following the photo session, I said "Happy Birthday," much to the confusion of our companions. He smiled "Thank you, God bless you!" I was asked how I knew it was his birthday? "I feel it's mine too in a way," I answered. Since creation of this blog, I've left this day's main post in the capable hands of the Commandant of the United States Marine Corps in the form of an unedited, unabridged ALMAR (All Marines bulletin). There is a difference today however, the current Commandant General James T. Conway has moved with the times as the Marine Corps has and has created the following video to play as he speaks. Also behold the opening narration from the legendary Sam Elliot speaking the words of Captain John Thomason. An E6?, one step from being a Gunny then. Lets hope he makes it. Happy Birthday and Semper fi!!! Why does that marine look so afraid??? I'd say it's more hero-worship nervousness than fear. Imagine being that poor S.Sgt - he'd go back to the boys on base with his story of who he met and no one would believe him. So who would win in a fight: Creedon, Sgt. Slaughter, or Gung Ho? Colonel, I was going to make fun of you for putting the USMC 2nd in your list of interests and ahead of redheads (which I take to mean actual girls) - 6th out of 11- (a failing grade), but that was before I saw how radiantly happy you look in this picture. Oh gimme a break! That list of interests was neither comprehensive or in any sort of cohesive order, it was random. I believe two thousand years hence the world shall be split between the Creedonist and Creedonite religious factions, they'll both follow the Creed of Creedon as laid down by the Lt.Col in his blog, in exactly the same manner. Where they'll essential differ is over which group has the coolest name. This will lead to generations of human suffering and strife. The Lt.Col will look down on it all and pronounce it Groovy. See what you started, Lt.Col? So I guess the only question is, are you a right wing Creedonite or a right wing Creedonist?, The choice is yours. LOL Did you see "Moon Over Parador" with Richard Dreyfuss? Yes. Librarians love blogs. In the future, my post apocalyptic brothers and sisters will marvel that one of their own knew you, indeed, had a signed autograph from you hanging above her desk at the actual library ;). Maybe they will even create a Creedon Classification system based on your likes and dislikes. My dog will be reanimated, given sentience and a pair of pink ceremonial reading glasses and will hold forth on the proper way to interpret the Creedon Classification Cataloging Rules, or for short, CCCR. And we are known for two things, mainly, amongst those who understand our ilk: We like to be able to find things and we give awesome parties. Outside of The Order, people think that we are all about shushing and collecting fines (stupid Chuck!). Though I love that librarian in that last Indiana Jones movie. Every time I process a book, I see her stamping it...WHAM!